We all like to over indulge occasionally, whether you are determined to get that last bite of a good meal in after being full 3 mouthfuls ago or having that last glass of a good bottle of red. Unfortunately over-eating or having too much to drink can then be accompanied with unwanted nausea. When you over eat, your digestive system is unable to process the food as it normally would, which causes you to feel nauseous. This can also be common in people who have weaker digestive systems or have had surgery that has changed the functional capacity of the digestive system. If you have overeaten, peppermint tea can be a good remedy to settle the stomach along with using some essential oils such as lemon, lavender or mint. 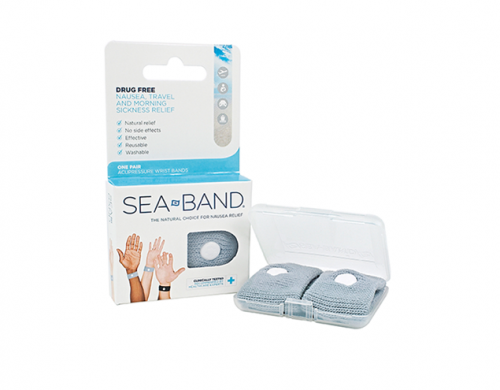 Sea-Bands will also be effective and can be used with any of these other methods of nausea relief. If you consume too much alcohol, it is highly likely you will develop a hangover the following day accompanied with a headache and nausea. Other symptoms may include fatigue, thirst and dizziness. There are limited options to combat a hangover, however drinking plenty of water to rehydrate your body, eating small bland foods, drinking fruit juice, adequate sleep and time will usually ease symptoms within 24 hours. Sea-Bands can also help with those nauseous feelings experienced during a hangover.